1858. 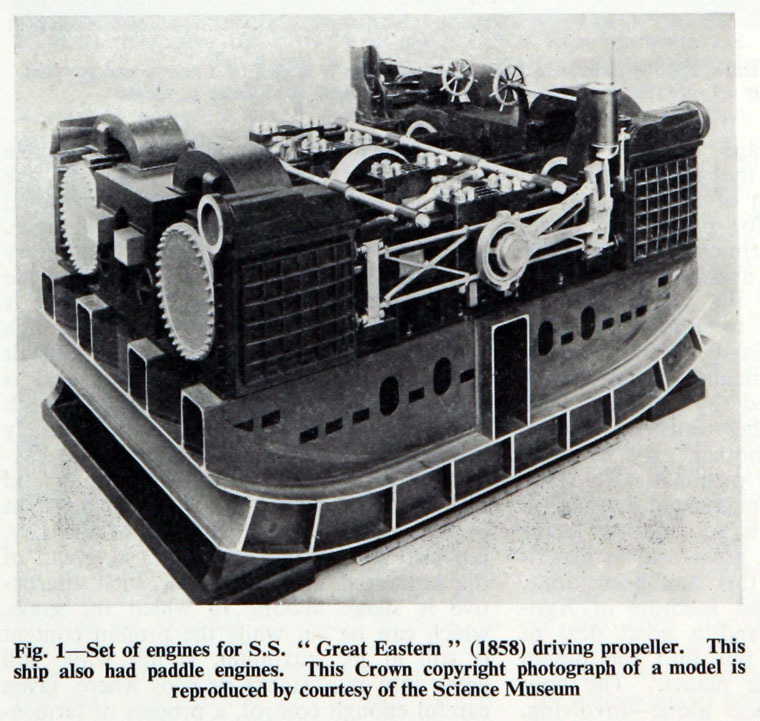 Set of engines for S.S. "Great Eastern " (1858) driving propeller. 1885. 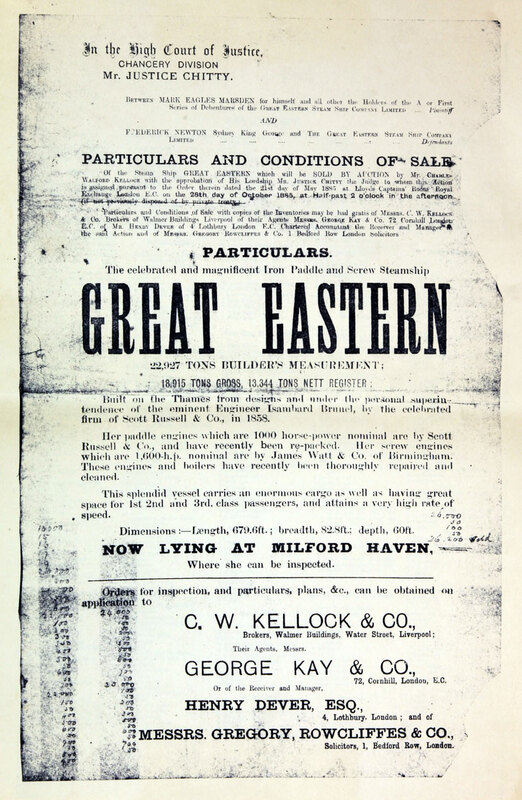 Auction brochure of SS Great Eastern. The SS Great Eastern was an iron sailing steam ship designed by Isambard Kingdom Brunel. She was the largest ship ever built at the time of her 1858 launch, and had the capacity to carry 4,000 passengers around the world without refueling. 1854 Brunel entered into a partnership with John Scott Russell, an experienced Naval Architect and ship builder, to construct the Great Eastern. She was built by Scott, Russell and Co's Napier Yard at Millwall, London, the keel being laid down on May 1, 1854. Unknown to Brunel, Russell was in financial difficulties. The two men disagreed on many details. It was Brunel's final great project, and he collapsed from a stroke after being photographed on her deck, and died only ten days later, a mere four days after Great Eastern's first sea trials. 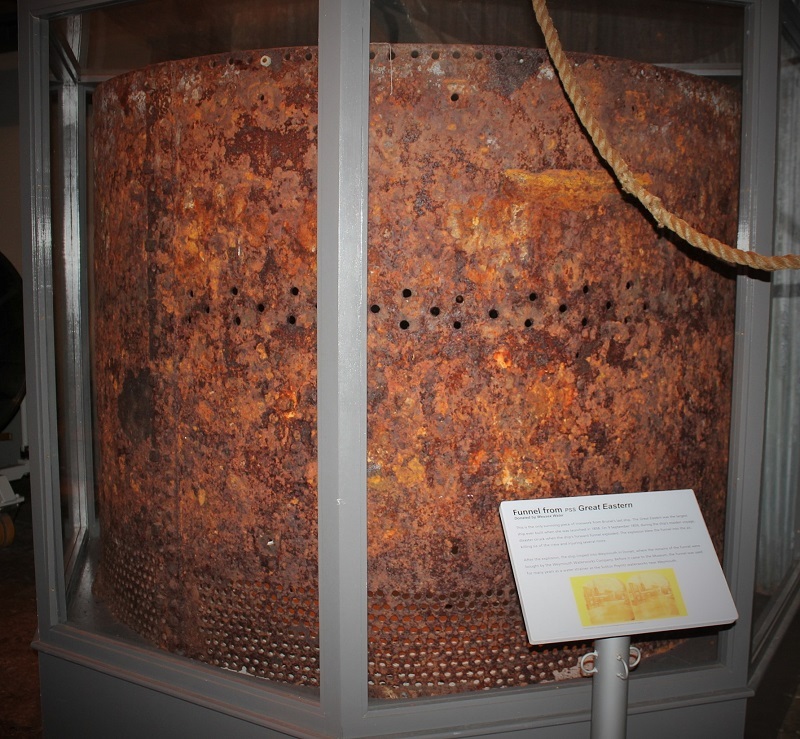 The hull was an all-iron construction, a double hull of 0.75 inch wrought iron in 2 ft 10in plates with ribs every 6 ft. Internally the hull was divided by two 350 ft long, 60 ft high, longitudinal bulkheads and further transverse bulkheads dividing the ship into nineteen compartments. The Great Eastern was the first ship to incorporate the double-skinned hull, a feature which would not be seen again in a ship for 100 years, but which is now compulsory for reasons of safety. She had sail, paddle and screw propulsion. 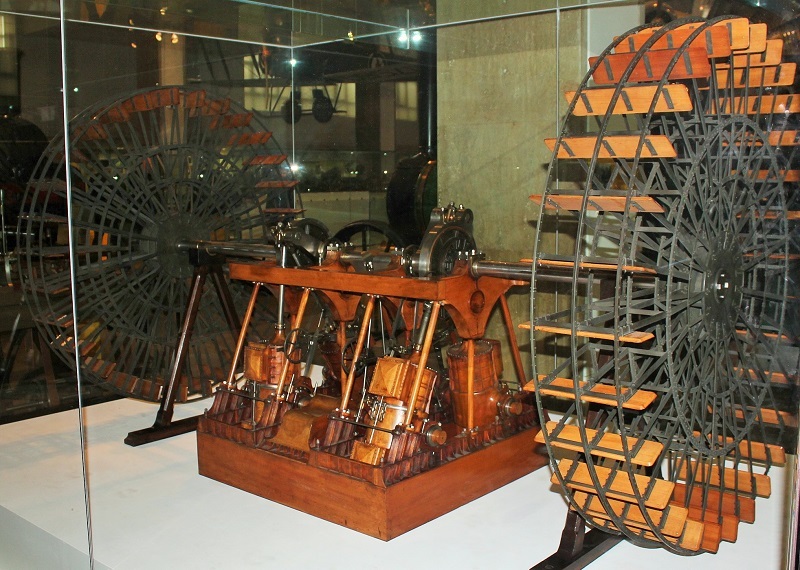 The paddle-wheels were 56 ft in diameter and the four-bladed screw-propeller was 24 ft across. 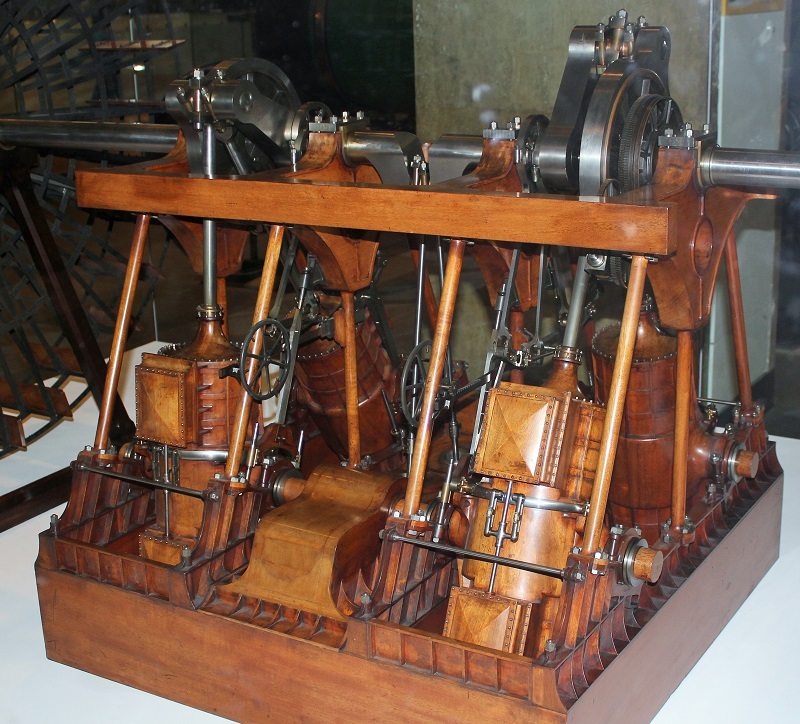 The power came from four steam engines for the paddles and an additional engine for the propeller. Total power was estimated at 8,000 hp. She had six masts (said to be named after the days of a week - Monday being the fore mast and Saturday the spanker mast), providing space for 18,148 square feet of sails (7 gaff and max. 9 (usually 4) square sails), rigged similar like a topsail schooner with a main gaff sail (fore-and-aft sail) on each mast, one "jib" on the fore mast and three square sails on masts no. 2 and no. 3 (Tuesday & Wednesday); for a time mast no. 4 was also fitted with three yards. In later years, some of the yards were removed. According to some sources (see External links) she would have carried 58,502 sq ft. This amount of canvas is obviously too much for seven fore-and-aft sails and max. 9 square sails. This (larger) figure of sail area lies only a few square meters below that the famous Flying P-Liner Preussen carried (with her five full-rigged masts of 30 square sails and a lot of stay sails). Setting sails turned out to be unusable at the same time as the paddles and screw were under steam, because the hot exhaust from the five (later four) funnels would set them on fire. Her maximum speed was 13 knots. 1858 January 31st. She was finally launched after many technical difficulties. She was 692 ft long, 83 ft wide, with a draft of 20 ft unloaded and 30 ft fully laden, and displaced 32,000 tons fully loaded. In comparison, SS Persia, launched in 1856, was 390 ft long with a 45 ft beam. She was at first named the SS Leviathan, but her high building and launching costs ruined the Eastern Steam Navigation Co, so she lay unfinished for a year before being sold to the Great Eastern Ship Co and finally renamed SS Great Eastern. 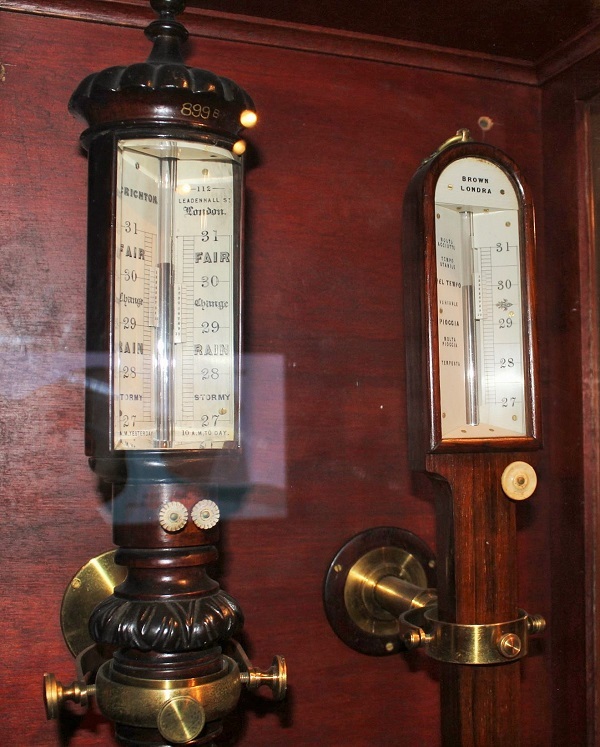 It was decided she would be more profitable on the Southampton–New York run, and outfitted accordingly. 1860 June 17th. After two trial trips in 1859, she set forth on her maiden voyage from Southampton to New York. On her eleven-day maiden voyage she carried 35 paying passengers, 8 company "dead heads" (passengers who don't pay) and 418 crew. Among the 35 passengers, eight officials and a crew of 418, were two journalists, Zerah Colburn and Alexander Lyman Holley. Also on board were with Mr. and Mrs. Daniel Gooch and Norman Scott Russell (Scott Russell's son). John Scott Russell, who had intended to sail on the maiden voyage, remained at home. Holley travelled as one of Scott Russell's personal friends. Norman Scott Russell stayed with Holley in New York for a few weeks. 1862 August 27th. The Great Eastern suffered an accident similar to that of the Titanic, but did not sink. She scraped on an uncharted rock off the coast of Long Island, which opened the outer hull over 9 feet wide and 83 feet long. However, the Great Eastern's inner hull was unbroken, and she made her way into New York the next day under her own steam. Nobody was hurt. The vessel was sold for £25,000 (her build cost has been estimated at £500,000) and converted into a cable-laying ship. Funnel no. 4 and some boilers were removed as well as great parts of the passenger rooms and saloons to give way to open top tanks for taking up the coiled cable. 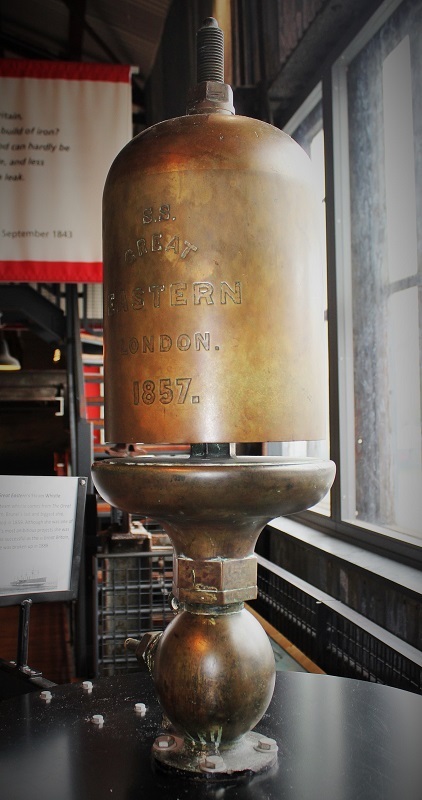 She laid 2,600 statute miles of the 1865 transatlantic telegraph cable. At the end of her cable-laying career she was refitted once again as a liner but once again efforts to make her a commercial success failed. She was used as a show-boat, a floating palace / concert hall and gymnasium. 1885 October 28th. Now lying at Milford Haven, she was auctioned by Charles Walford Kellock and Co at Lloyd's Captains' Room, Royal Exchange, London. 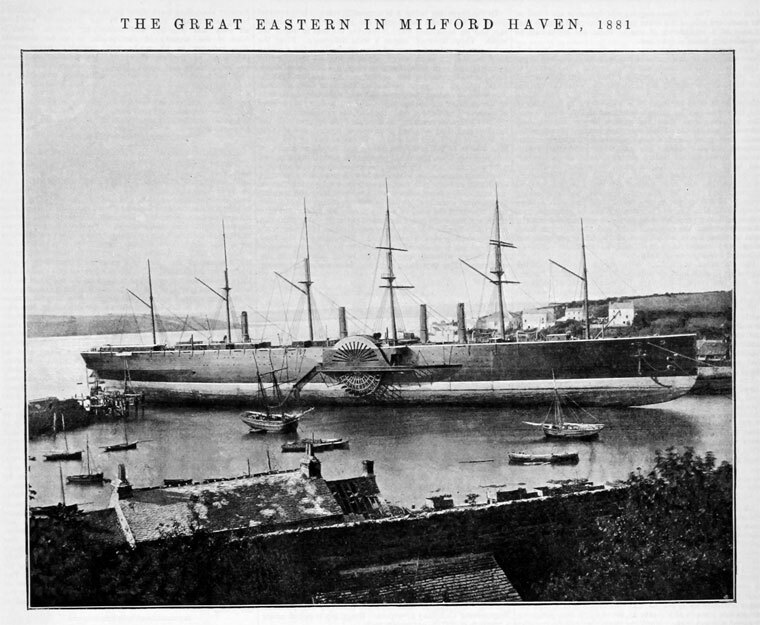 View a full copy of the Great Eastern Brochure. The brochure contains 6 pages detailing the inventory at the time in every room. Few copies were made since they were provided on request only to interested parties. This original was owned by the Duke of Norfolk and believed to have been lost in a fire at his home (although unsubstantiated). 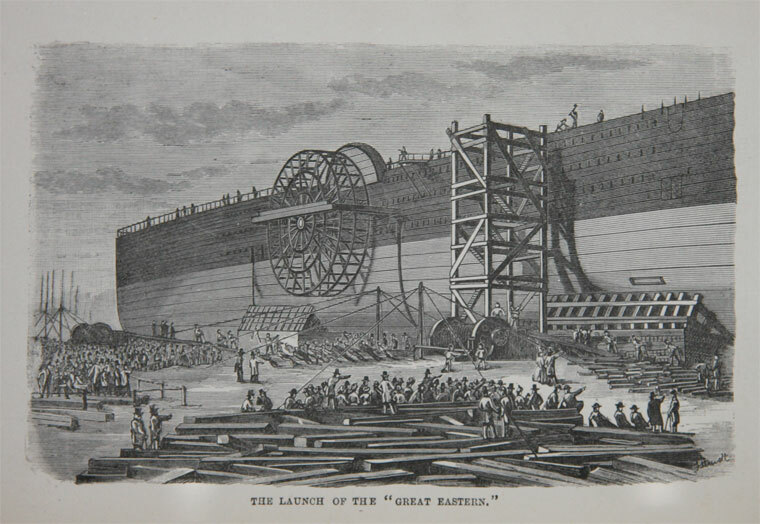 In 1886 The Engineer ran a series of detailed articles about the SS Great Eastern. (No. I) : The Engineer 1886/05/07. (No. II): The Engineer 1886/05/14. This page was last edited on 12 March 2018, at 14:59.